Breakfast smoothie bowls are all the rage right now for a good reason! These healthy fruit and yogurt bowls are beautiful, healthy, and endlessly customizable ~ they're gluten free, high protein, and so delicious! To make the granola, toss the oats with the oil, honey, and flax seeds to coat well. Spread the oats out onto a baking sheet and bake for about 15-20 minutes, until the oats are golden brown. I give the pan a stir several times during the baking. Let cool. To make the smoothie, put the berries in a blender and blend until pureed. Add the yogurt and blend again until smooth. 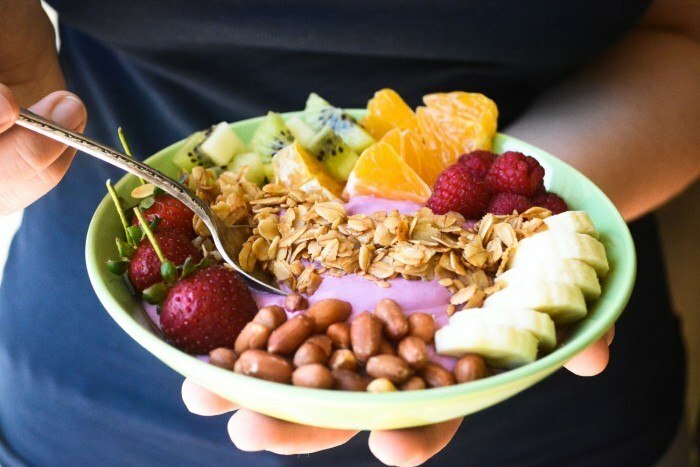 Spoon the yogurt into a shallow bowl and top with assorted fruits and nuts. Sprinkle the granola over the top and enjoy.